This lovely family found me in a Google search. Mom was looking for a local photographer in Vancouver WA that not only was close by, but matched her style. She likes the clean, timeless and classic newborn photos. This beautiful baby girl was 10 days old on the day of the session. She was sleepy and easily curled into those cute poses that everyone loves. This image was created with Fall in mind. The days are getting cooler and the leaves are changing colors. I chose the colors in this image two ways. The first was after looking at the questionnaire and seeing that the baby's nursery was purple green with some yellow. I've had this image in mind for awhile and was excited to pull it together. 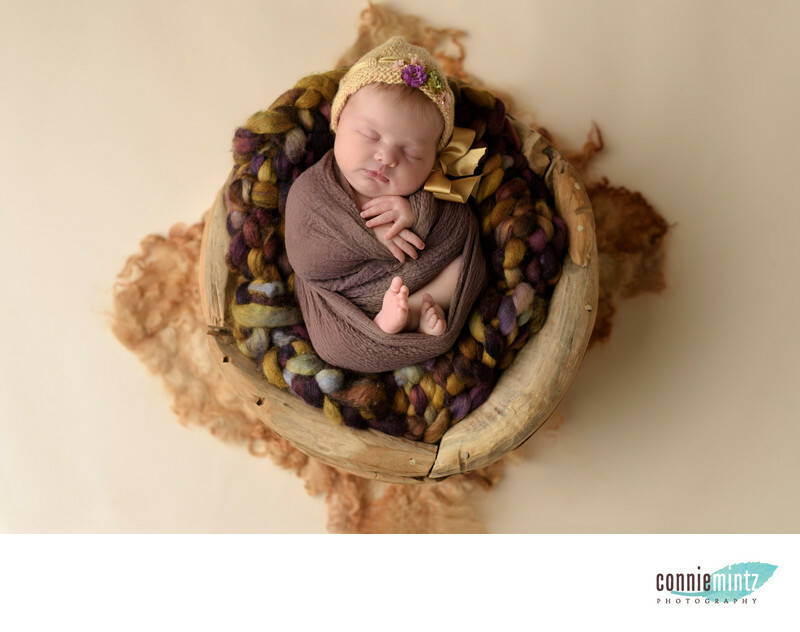 The hat in this image is from a newborn photography prop shop called Pooks & Lulu (http://www.pooksandlulu.bigcartel.com). The wooly layer is from Ababa Baby (http://www.ababababy.bigcartel.com). I knitted the layer beneath the baby with spinning yarn. The roving was purchased at Twisted, a yarn shop in Portland OR. There is a lot that goes into an image like this. First is to have a vision and then to have the skills to impement. it . I work with my families to create precious images that they will adore forever. Just imagine seeing yourself as such a cute bunble when you are ll grown up! Location: 13611 NW 44th Ct, Vancouver, WA 98685. 1/160; f/2.5; ISO 64; 50.0 mm.